All love begins and ends with motherhood once said, Sir Robert Browning. What about dads? Well, fathers are those heroes who not only represent discipline and responsibility but also put the craziest, best foot forward with their laid-back attitudes and hilarious dad jokes. When left alone with their little babies they become "naughty dads" or simply as one famous song goes "Daddy Cool"(by Boney M). 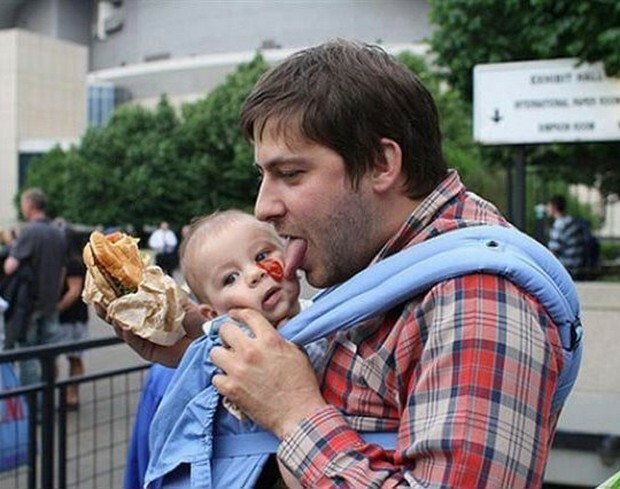 While moms become crazy looking after the baby, dads go crazy with the baby. Because “What in the world could go wrong?” or “I’m there, loosen up a little woman”. 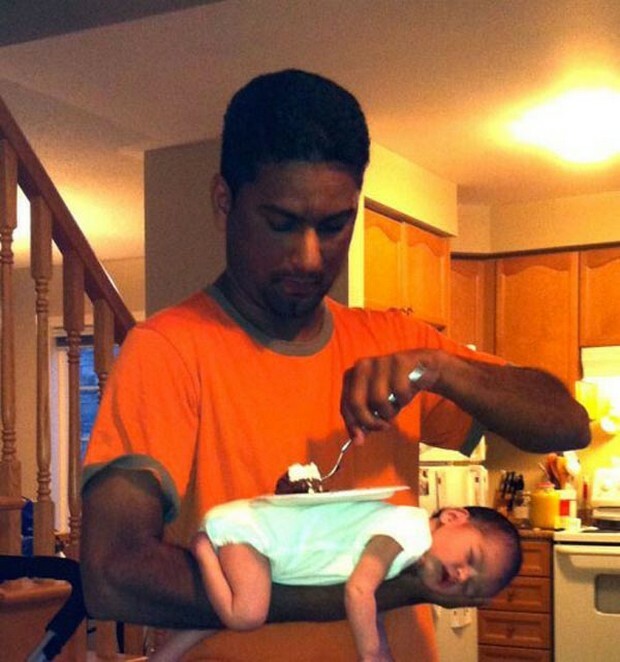 Whether it's dressing up the baby to multitasking in the presence of the baby, dads have done it all. With a little effort, they bring about the best of memories of our childhood. And thanks to these wonderful pieces of evidence we will get to know it too. 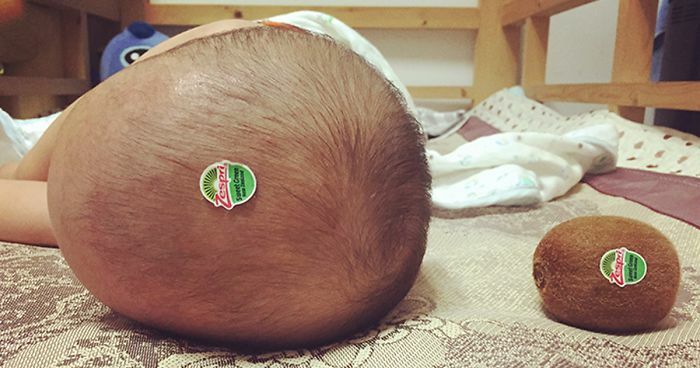 Guaranteed you cannot stop yourself from giggling at these small amazingly innocent babies with their naughty dads. No food should be wasted, kid. Oops! sorry kid. Let me clean that up without wasting this delicious mixture of spices which people call food. You are going to fall in love with it too. She wanted to sleep, I wanted food. problem solved! "The Only Way My 3 Day-Old Daughter Would Fall Asleep. After Two Hours Of Carrying Her Around, I Got Hungry. "My sweet, little, beautiful child. We are going to get you fresh." "You can be whatever you want a son.Like Dumbledore from Harry Potter or Talosians from Star Trek." 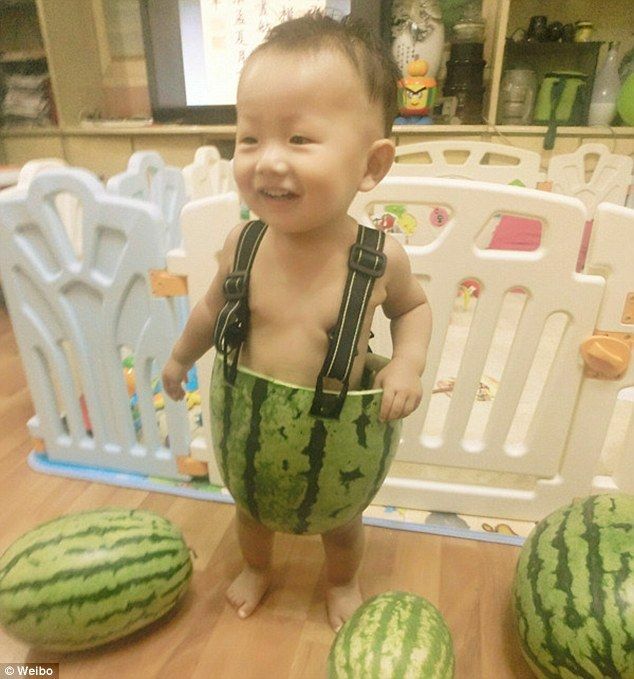 In the hottest of summer, this dad found a way to keep his baby cool and what is better than the cool summer fruit watermelon. "Honey, where did you find this giant kiwi?" Mom goes to find their baby and realizes that the other kiwi is indeed their kid whose head looks like a giant kiwi. How may this one have happened? 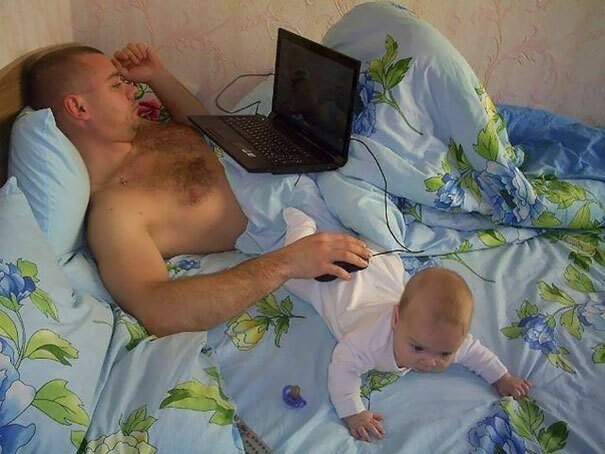 Well, the story goes like this.Mom left the babu under the care of the father but dad apparently got bored so decided to get his work done, but couldn't find the mouse pad. The solution, why not use the baby? Could track him/her whilst completing the work.Perfect! This dad, when left alone with his son, drew eyebrows on him and the result was not a disappointment. "This is how you stop the baby from messing around the house. Saves a lot of energy and messes." Hence, the memo that comes with the responsibility of being a parent, the one which screams "handle with care" can sometimes not be followed to create pictures that bring a lifetime of joy. Browse and you will find many more such pieces of evidence that will make you wish for such beautiful memories along with the stories behind them.